If the fuel filler lid does not open because ice has formed around it, tap lightly or push on the lid to break the ice and release the lid. Do not pry on the lid. If necessary, spray around the lid with an approved de-icer fluid (do not use radiator anti-freeze) or move the vehicle to a warm place and allow the ice to melt. 2. 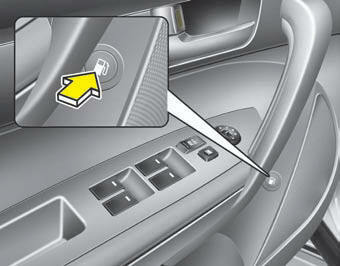 To open the fuel filler lid, push the fuel filler lid opener (if equipped). Closing the fuel filler lid 1. To install the cap, turn it clockwise until it “clicks”. This indicates that the cap is securely tightened. • If pressurized fuel sprays out, it can cover your clothes or skin and subject you to the risk of fire and burns. Always remove the fuel cap carefully and slowly. If the cap is venting fuel or if you hear a hissing sound, wait until the condition stops before completely removing the cap. WARNING - Refueling dangers Automotive fuels are flammable materials. When refueling, please note the following guidelines carefully. • Make sure to refuel your vehicle according to the “Fuel requirements” suggested in section 1. 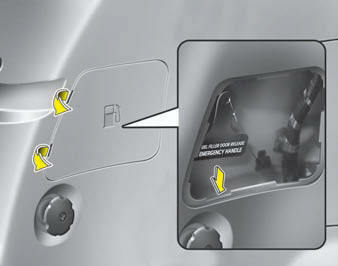 Emergency fuel filler lid release If the fuel filler lid does not open using the remote fuel filler lid release, you can open it manually. Remove the panel in the luggage compartment area. Pull the handle out slightly. 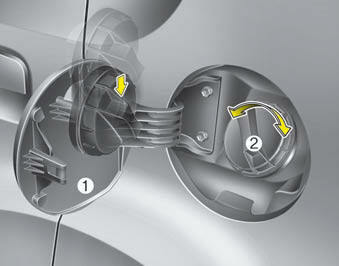 Do not pull the handle excessively, otherwise the luggage compartment area trim or release handle may be damaged.